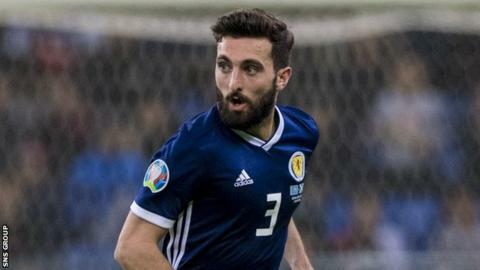 Aberdeen boss Derek McInnes is backing Graeme Shinnie to "bounce back quickly" from his Scotland disappointment. The 27-year-old spoke candidly of fears for his international future after being used as a stand-in left-back for the 3-0 defeat in Kazakhstan. The Dons captain did not feature in the following 2-0 win away to San Marino. "For Graeme to have taken so much criticism for it has really angered me over the last little while," said McInnes. "It is bang out of order." Shinnie, who has experience at full-back but has played predominantly in centre midfield for Aberdeen in recent seasons, was used in the back four at the Astana Arena after Kieran Tierney and Andy Robertson were ruled out. Following the sobering loss he admitted culpability for the goals scored by the team ranked 117th in the world. "Graeme is guilty of being too honest for his own good," McInnes told the club website. "He only played a part on a miserable night for the country. "Everyone else played their part. Everyone involved has to take their responsibility. "The fact we made so few tackles, committed so few fouls, did not show enough competitiveness; that had a bigger part to play for me. "Graeme is someone who playing for their county means so much to him. I can understand his disappointment that he has not managed to take his opportunity and not showed what he is capable of. But in terms of his honesty, his commitment, he would win that fight hands down over any other player. "Graeme will bounce back quickly. He is that type of player. If I could have a team full of Graeme Shinnies I would have them. I would not swap him for anyone. He means everything to me and how we want to play. "He has got his faults at times, no one is perfect, but he is someone who is so fiercely driven and fiercely competitive. "If he had been played in the position he has been playing, he would have had a bigger impact on the game than maybe some others. "He is my captain. The players look up to him. He has to put it down to a bad day and it happens. He has had more good days than bad."